Assurances of protection against North Korea’s arsenal are too flimsy to form the bedrock of any deterrence strategy. 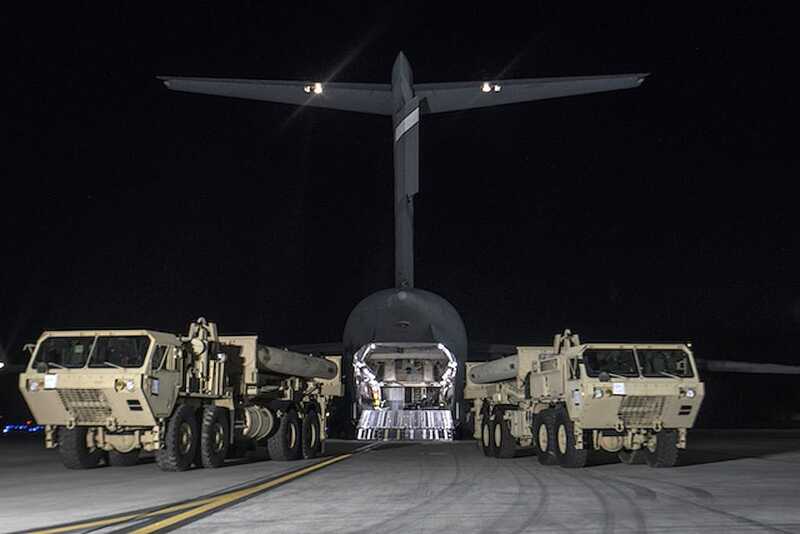 Still, South Korea is moving forward with THAAD, the Terminal High-Altitude Air Defense system, shrugging off withering pressure from both domestic constituencies and China. Japan, still toeing the line on its self-imposed ban on offensive military capabilities and well within the range of a number of North Korean missiles, is keen to accelerate the deployment of a sophisticated new version of the U.S. Aegis system. In the U.S., meanwhile, the House of Representatives’ version of the 2018 National Defense Authorization Act directed the Pentagon to begin development of “a space-based sensor layer for ballistic missile defense.” A bipartisan group of senators wants to triple the scale of a BMD system designed to protect the U.S. mainland. All this reflects a growing but unpalatable consensus between the U.S. and its allies in Northeast Asia: The U.S. has reached the point where it must decide to either live with the North Korean nuclear threat or do something about it. Doing something about it would be costly, and possibly unacceptably so. At minimum, North Korea has the capability to lay waste to Seoul with the conventional artillery it has amassed along the demilitarized zone, while the threat from its expanding ballistic missile arsenal to South Korea and Japan – along with U.S. assets there – cannot be dismissed. But choosing to live with a nuclear North Korea – particularly one with the ability to strike the U.S. mainland – would put U.S. core imperatives at risk and potentially undermine the U.S. strategic position in the Western Pacific. Neither option is a good option, hence the surge of interest in BMD – whether as a means to contain the fallout of a North Korean counterattack during a conflict or perhaps even to reduce the need for a conflict in the first place. This raises the question: Could developments in ballistic missile defense expand the set of options available in the North Korea crisis? The following report explores the value and limits of missile defense, both as a practical deterrent against North Korea and as a factor in U.S. strategy in the region. It makes the case that, ultimately, BMD will not make the choice facing the U.S. any easier. Advancements in BMD could have a major effect on the battlefield and could limit the casualties in a war. But the technology is too limited, expensive, and technically and operationally unproven in combat situations to eliminate the threat posed by North Korea. And so long as there is a reasonable chance of even one nuclear warhead penetrating defenses, the strategic calculations of the U.S. and its allies will be effectively the same as if missile defense didn’t exist at all. The U.S. began to pour money into missile defense systems as soon as it showed the destructive power of nuclear weapons at the end of World War II. BMD became a fixture of U.S. defense planning throughout the Cold War, with investment peaking under President Ronald Reagan’s Strategic Defense Initiative during the mid-1980s. Eventually, the amount of money needed to counter advanced arsenals from countries like Russia and China was deemed unsustainable. So after the collapse of the Soviet Union, the focus on missile defense shifted to emerging, more limited threats from so-called rogue states like Iran, Iraq and North Korea. Since 2002, the U.S. has spent between $8 billion and $10 billion annually on research, testing and deployment of BMD systems – almost all of it under the watchful eye of the U.S. Missile Defense Agency. Today, the U.S. is developing interception capabilities that target both ballistic missiles and cruise missiles. Cruise missiles are self-propelled for the majority of their flight. They generally fly slower than ballistic missiles, but also lower to the ground (potentially evading radar detection) and can be retargeted or accelerated mid-flight. By comparison, ballistic missile fly on a high, arcing and fixed trajectory, with the help of a rocket booster only during the first few minutes of a flight, and return to earth at higher speeds. Ballistic missile flightpaths can be divided into three stages, each posing unique challenges to interceptors. The first stage after launch is known as the boost phase, when the rocket boosters thrust the missile through the atmosphere and, with longer-range missiles, into space. Missiles in this phase are difficult to intercept; at 3-5 minutes, it is simply too brief a period for defenses to respond in time. (Defenses such as laser-equipped aircraft would have to have already been stationed near the launch site to have a chance in this small window of opportunity, and so would be vulnerable to attack.) As a result, the U.S. is believed to have made only scant progress toward this capability. No boost phase BMD systems are currently deployed, and next-generation boost phase defenses such as solid-state lasers are not expected to be ready for another decade. At this point, “left of launch” measures such as cyber- and electronic warfare capabilities meant to sabotage launches could be considered the United States’ first line of missile defense. A ballistic missile is considerably more vulnerable to interception during the second and longest stage of its flightpath, known as the midcourse phase (a combination of ascent and descent phases). Here, longer-range missiles are flying unpowered through the vacuum of space, simplifying the task for interceptors. Two of the four U.S. missile defense systems currently deployed — the Ground-Based Midcourse Defense system and the Aegis system, each equipped with the SM-3 interceptor – targets this phase of the flight path. The third stage, when the missile re-enters the Earth’s atmosphere, is known as the terminal phase. At this stage, the target country has had the most warning time to prepare its BMD systems. Interception in the terminal phase is tricky, however, given the high speeds — between 3,000 and 15,000 mph (4,800-24,000 kph) — at which the missile is traveling. Generally, the longer-range the missile, the higher its speed on re-entry, making intermediate-range and intercontinental ballistic missiles (the only ones capable of hitting the U.S. mainland) exceedingly difficult to shoot down. Nonetheless, three of the four deployed U.S. systems (including some Aegis variants) target the terminal phase. The U.S. ballistic missile defense network is built around four systems, each of which has different capabilities and levels of success in testing. To maximize the chances of interception, different systems targeting different phases of the flightpath are often deployed in tandem. Broadly speaking, each works in a similar way. After the trajectory of the launch of an incoming ballistic missile is determined, a volley of interceptor missiles will be fired in response. The size of the volley depends on the system; THAAD batteries, for example, can have as many as 72 interceptors. The interceptors rely on an array of radar, satellite and other sensors – plus sophisticated command-and-control systems – to detect, track and target the incoming missile. Some interceptors are maneuverable and can adjust course during the intercept, an advantage over ballistic missiles flying on a fixed trajectory. Some contain explosives that detonate close to the target. Others will simply collide with the incoming missile, relying on kinetic energy to destroy the target well out of harm’s way. The workhorse of U.S. missile defense is the Patriot system, the only U.S. system to have been used in combat. (An early Patriot variant struggled against Scud missiles in the first Iraq War. Since 2015, however, Patriot Advanced Capability-3, or PAC-3, batteries deployed by Gulf states in Yemen have purportedly performed flawlessly.) The truck-mounted batteries, which target missiles during their terminal phase, are mobile, flexible and relatively inexpensive compared to the other systems. But with a range of around just 12 miles, the system provides a much smaller window of coverage than newer systems. Thus, it is generally used for point defense of relatively small areas such as military bases, airfields, missile launch sites and populated areas. Deployed in tandem with other systems, it can be considered the last line of defense. It is best suited for slower short-range missiles, as well as other aerial threats such as cruise missiles, drones and aircraft. Patriot systems are deployed around the world, including by many U.S. allies. In a conflict with North Korea, they would be used primarily in concert with other systems to provide two-tiered defense of major populated centers in South Korea and Japan, as well as military installations. They would also be used to protect Guam. Despite its limitations, the system would see the heaviest use, given its ability to defend against more conventional, against short-range North Korean threats launched from just across the border. Like the Patriot system, the Terminal High Altitude Area Defense system, or THAAD, targets incoming missiles during the terminal phase using land-based batteries. It is less mobile than the PAC-3, but its powerful radars give it an improved range of 120 miles and high-altitude capabilities, making up for some of Patriot’s limitations and allowing it to engage even some exo-atmospheric targets. It has a flawless testing record. Its radars also serve early warning functions and can be used to cue certain Patriot variants. In a conflict with North Korea, it would be used in tandem with the Patriots to provide two-tiered point defense against vulnerable civilian and military targets in South Korea and Guam. (It is not deployed in Japan.) However, it is useless against cruise missiles, drones and aircraft. It also cannot protect the U.S. mainland from ICBM attack because of the high speeds at which such missiles re-enter the atmosphere, and thus is not deployed there. The next, most flexible layer of defense is provided by the Aegis BMD system. The system is used with the Standard Missile family of interceptors, each of which has somewhat different capabilities, ranges and ceilings. This makes the system adaptable to address a broad range of threats, whether from short-, medium- or intermediate-range missiles, in either the endo-atmospheric or the exo-atmospheric stage. The newest variant of the SM-3 interceptor, Block IIA, boasts a range of as much as 1,550 miles and is intended to shoot down long-range missiles in the midcourse phase. Other variants target cruise missiles and shorter-range ballistic missiles in the terminal phase. Most Aegis systems are deployed aboard naval cruisers and destroyers, affording the U.S. and Japan (which has six such warship-based systems) further flexibility to adapt to evolving threat environments. Deploying Aegis on warships has the added benefit of depriving adversaries of a fixed target that they can attack to try to punch holes in the U.S. BMD network, while also allowing the U.S. to avoid the political sensitivities that often come with land-based deployments of missile defense systems on foreign soil. There is, however, a land-based version of the system called Aegis Ashore. The benefits of land-based variants include greater around-the-clock monitoring, while also potentially allowing destroyers to participate in non-missile defense operations if required. Japan is mulling deploying Aegis Ashore. The fourth, newest and perhaps most ambitious BMD layer is the Ground-Based Midcourse Defense system, which has been in development only since 2003. As the name suggests, this system is fired from fixed, land-based silos and is intended to intercept incoming missiles during the midcourse phase. More than any of the other systems, the long-term hope for the Ground-Based Midcourse Defense system is that it will be capable of targeting longer-range missiles, including ICBMs. In May, it was tested successfully against an ICBM for the first time. The U.S. has deployed 36 Ground-Based Interceptors in Alaska and California, a number that is expected to rise to 44 by the end of the year. There is a movement afoot in the U.S. Congress to triple the size of this deployment. In a conflict with North Korea, the Ground-Based Midcourse Defense system would attempt to mitigate threats from North Korea’s newest, longest-range missiles like the Hwasong-12 and Hwasong-14. North Korea has only a small arsenal of cruise missiles – most of them apparently copies of an old Russian anti-ship model – and it’s doubtful that they can yet deliver a nuclear warhead. Cruise missiles do not appear to be a major focus of the country’s recent missile programs. The proliferation of cruise missile technology nonetheless poses unique challenges for missile shields. U.S. cruise missile defenses are built around three ship-launched short-range interceptors – the Evolved Sea Sparrow Missile (ESSM), the SM-2 and the SM-6 – and a system involving the PAC-3. Some of these have been used successfully to intercept anti-ship cruise missiles off Yemen. Given the difficulty of detecting and tracking launches, the dependability of interceptors in any conflict will hinge on the ability to be deployed in relatively close proximity to launch sites, thus making defensive systems themselves vulnerable to attack. Several other research and development efforts are underway, including on systems featuring lasers and high velocity guns, but these are not yet ready for deployment. In 2012, in fact, the Pentagon canceled several next-generation programs, including ones targeting the boost phase, citing spiraling costs and operational and technical challenges. Still, the future of BMD development is likely to prioritize advanced radars, space-based infrared sensors, airborne boost-phase laser interceptors and more maneuverable vehicles. In theory, the combination of these systems should provide a multilayered, adaptable missile shield capable of addressing a wide range of missile threats. In reality, challenges remain. The system relies on a number of unproven component parts. Steep technical constraints mean the chances of stopping certain missile types are low, at best. (The task at hand, after all, is akin to firing a bullet at another bullet — sometimes in space.) And cost constraints hinder the ability of the U.S. to sufficiently boost the odds of a successful intercept simply by deploying vast numbers of interceptors. BMD capabilities weaken considerably with longer-range missiles. The extreme speeds at which intermediate-range ballistic missiles (defined by the Pentagon as having a range of 3,000–5,500 kilometers, which is about 1,850-3,400 miles) and intercontinental ballistic missiles (with a range exceeding 5,500 kilometers) re-enter the Earth’s atmosphere are simply too fast for current intercept systems. This makes terminal-phase defenses like the Patriot and THAAD all but useless against the very systems the U.S. is concerned with most from North Korea. As a result, neither system is deployed in the U.S. mainland. Longer-range missiles akin to North Korea’s Hwasong-12 and Hwasong-14 missiles (which boast estimated ranges of up to 3,700 miles and 6,200 miles, respectively) can practically be targeted only during the midcourse phase, when they are traveling unpowered on a fixed trajectory through space. Only the Ground-Based Midcourse Defense system is configured to intercept an ICBM. The U.S. has conducted only a single successful test against an ICBM, and the test was conducted in a highly controlled environment to maximize the chances for success. The estimated range of the missile targeted — just over 3,700 miles — was also on the short end of the distance ICBMs can travel. Interception at the ranges believed to be achievable by North Korea’s newest missiles is an order of magnitude more difficult. Any incoming ballistic missile would likely be targeted with multiple interceptors. The comparatively lower cost of decoys, however, makes it possible to deploy them in numbers sufficient to overwhelm the interceptors, increasing the likelihood of penetration to a degree unacceptable for the country being targeted. In a conflict with North Korea, it may fire hundreds of missiles, each containing a dozen or more decoys. Packing in even relatively lightweight decoys comes at a cost to the range of a missile, thus limiting how much a country like North Korea can rely on them. Still, the math can get ugly. Decoys aren’t a problem in the initial boost phase of a missile’s flight, before the decoys would be deployed. But this stage is where missile-defense technology is the least advanced. With most ballistic missiles, there is believed to be a minute or two from when boosting stops and the decoys are deployed, but this window is believed to be too narrow for reliable interception. Though BMD systems have performed consistently well in flight tests, particularly against shorter-range missiles, these tests are usually set up in ways that maximize chances for success. U.S. authorities are not exactly forthcoming with details about the conditions under which BMD systems are tested — and understandably so. But countermeasures are believed to be used minimally in most such tests, if they are used at all. (In fact, a number of missiles used in BMD tests over the past decade contained homing beacons.) Meanwhile, testers know well in advance the basic trajectory of the incoming flight and a short window during which to expect the launch. Testers can also control for variables such as weather and (with Aegis) sea conditions. Perhaps most important, they are not contending with the myriad unexpected complexities that inevitably will arise in a combat environment. Except for the Patriots, none of the available U.S. BMD systems has been tested in a combat environment. This isn’t to discredit the progress made. There are ample technical questions that can be solved with even a test that has been effectively rigged for success. But the testing success rates touted by the U.S. Missile Defense Agency — not to mention the private firms building these systems — belies deep uncertainties about U.S. ballistic missile defenses and the steep technical and operational challenges that would need to be overcome before building a nuclear deterrence strategy around them. Even if the technical challenges could be overcome, the cost of providing blanket BMD coverage to the U.S. and its allies would be staggering and poses major operational limitations. Ground-Based Interceptor missiles are believed to run $70 million to $100 million apiece. Next-generation systems may cost even more. According to the National Academy of Sciences, a system of space-based interceptors could run as much as $300 billion — 10 times as much as any other system. Costs rise considerably when accounting for all the command-and-control and ancillary support systems that must be in place to integrate hundreds of batteries into one network. Costs rise further when considering the demands of keeping such systems deployed and on alert in perpetuity. All told, the U.S. has spent some $190 billion on BMD since 1985, with limited results. This causes problems in both development and deployment. For example, tests are expensive and thus infrequent, making testers risk-averse, lest unsuccessful tests lead to a loss of funding. It also poses operational constraints, limiting coverage windows and forcing those deploying BMD systems to pre-position assets in anticipation of what North Korea may choose to target. The United States and its wealthier allies have a lot of money to throw at ballistic missile defense, but not an endless amount. Competing budget priorities and political limitations are institutional realities that cannot be discounted. And every dollar spent on BMD is one not invested in other capabilities more likely to be needed to either contain or combat the North Koreans. In this way, BMD investments can be counterproductive. And the U.S., in any case, tends to obsess over complex and unproven weapons systems. Of course, U.S. BMD technology will improve, and costs could even come down. This is, in part, why the Russians are so agitated about NATO BMD systems deployed in Central and Eastern Europe, and why the Chinese oppose South Korea’s deployment of THAAD, a system that can easily be configured to minimize radar penetration into Chinese airspace and that cannot yet stop a Chinese ICBM, anyway. With sufficient technological improvements, U.S. BMD deployments would seriously undermine the Russian and Chinese nuclear deterrents. Their defense planners are preparing for worst-case scenarios. We can assume that the U.S. will develop more sophisticated capabilities to mitigate countermeasures, along with more sophisticated radars and space-based sensors. But we can also assume technological development by the North Koreans, not to mention a continued buildup of an arsenal more capable of saturating U.S. defenses with sheer numbers. The burden of proof of success is on the defense. For the attacking country, an intercepted missile is a setback. For the country trying to shoot down a nuclear-tipped missile, a middling interception rate spells disaster. As it stands, U.S. BMD defenses are porous at best, and assurances of protection against even a relatively unsophisticated missile arsenal like that being developed by North Korea are too flimsy to form the bedrock of any deterrence strategy. Nuclear deterrence is a high-stakes game, and BMD cannot be a game-changer until it is fool-proof. The U.S. missile shield is not and is unlikely to be airtight for the foreseeable future. This reality, compounded by the possibility of North Korea’s finding other ways to deliver a nuclear device or to transfer the technology to other U.S. adversaries, means the U.S. choice regarding North Korea’s nuclear program will not get easier. BMD development may reduce the risk of living with a nuclear North Korea marginally, but not to a degree that will affect U.S. decision-making in the current crisis. Similarly, the systems deployed on the Korean Peninsula do not provide the level of assurance South Korea would need to wholeheartedly support a U.S. operation that puts Seoul at risk. Japan’s calculations will not change even if it pushes through with its new Aegis deployment. These same factors mean BMD certainly won’t make North Korea any more inclined to strike a deal. For the U.S. and its allies, the outcome of the crisis will hinge primarily on familiar variables. The option of doing something about North Korea’s nuclear program hinges on whether the U.S. and its allies believe its conventional strike capabilities can mitigate Pyongyang’s conventional deterrent. The option of living with a nuclear North Korea hinges on whether the U.S. decides that its traditional nuclear deterrent – mutually assured destruction – would still work. Missile defense may be useful as a tool in either scenario, but it is not a solution. Neither the U.S. nor its allies can wield it as such. — Ballistic Missile Defense Is a Tool, Not a Strategy originally appeared at Geopolitical Futures.